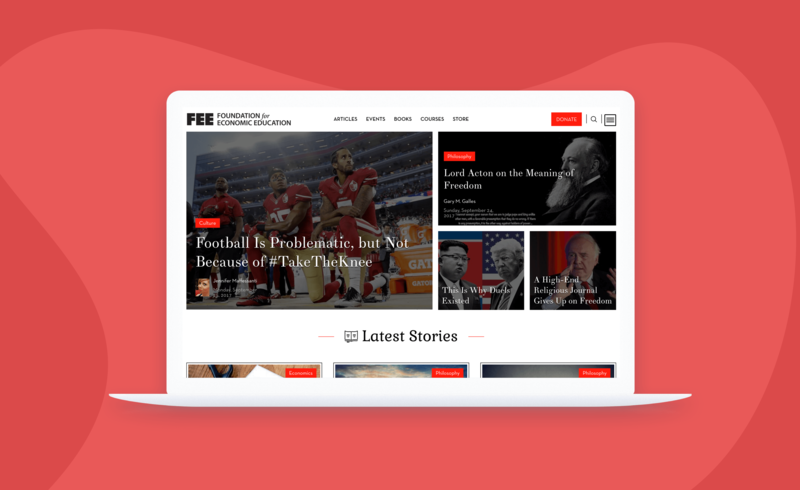 FEE.org is the official website for The Foundation for Economic Education, a nonprofit organization whose mission is to inspire, educate, and connect young adults with the economic, ethical, and legal principles of a free society. Founded in 1946, FEE was the first free-market organization in the United States, producing nationwide seminars, classroom resources, social media, online courses, and engaging daily content designed to educate young people on the ideas of a free society. We recently asked Leisa Miller, Marketing Associate at FEE to tell us about the problem they were trying to solve when they discovered ConvertFlow. She added: “Previously, we used another service called Sumo. But we weren’t thrilled with their product, so we started searching on Google for a better solution. "Our site gets almost a million visitors every month, but only a small percentage of those are actually on our email list. We wanted to display popups on our site to help grow our email list." Explaining their reasons for switching to ConvertFlow, Leisa told us: “since we have a dev team, we tried building the popups ourselves at first, but it was a lot of work. "We tried building popups ourselves at first, but it was a lot of work. We tried Sumo, but it was “buggy”, their support team was slow, our conversions were abysmal, and they didn’t have any real integration for targeting our HubSpot users. Then we found ConvertFlow"
"Our conversion rates are through the roof since we started using ConvertFlow. We created a CTA to target potential donors - and that CTA has had above a 4% conversion rate since we launched it!" Armed with ConvertFlow’s ability to target subscribers and donors based on HubSpot contact data, FEE.org is successfully raising the funds needed to fulfill their core mission: educating young adults about economic, ethical, and legal principles of a free society. "When we used Sumo, our conversion rates would start at a 0.7% conversion rate and drop to 0.5%, after a couple days. With ConvertFlow though, it’s not uncommon for our conversion rates to start at above 4% and then slowly stabilize at around 2% after about two weeks."